226 pages | 10 B/W Illus. The growing importance of the Korean economy in the global arena and the spread of the so-called ‘Korean wave’ in Asia mean there is an increasing desire to understand contemporary Korean Society. To this end, this book provides a critical and progressive analysis of the diverse issues that impact on and shape contemporary Korean society at both local and national levels. 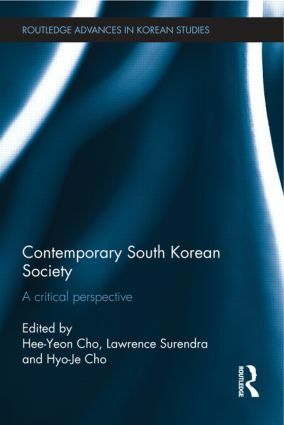 The chapters in this volume provide a critical perspective on Korean society, and draw upon interdisciplinary research from across the social sciences. With contributions from leading Korean scholars and academics from around the world, this is a welcome addition to the growing field of Korean Studies, and will be of great interest to students and scholars interested in Korean studies, Korean and Asian culture and society, and Asian studies more generally. Korea is currently experiencing its most significant transformations since the end of the Korean war. This series is a showcase for the latest research on North and South Korea. The series is interdisciplinary in its focus.